Investment options like real estate are often looked upon as a way out to save money on taxes people pay to the government. According to Dmitri Chavkerov, this turns out to be a major hindrance for one to attain the path of success as they will have to channel all the money they have towards the unwanted monetary commitment created to save on taxes. 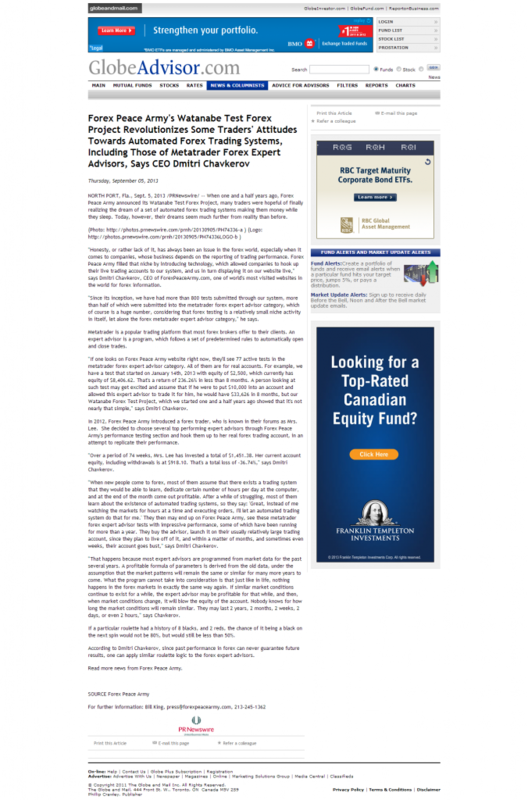 NORTH PORT, Fla., Nov. 5, 2013 /PRNewswire/ — Dmitri Chavkerov, CEO of Forex Peace Army, advises people not to make unwanted monetary commitments so that they can lower the tax amount paid as it would eventually cost them much more than they had expected. Forex Peace Army, an established forex trading information portal online, is the brainchild of Dmitri Chavkerov, who has been helping traders attain success with effective methods and techniques. “As you get richer, you will have to pay more in taxes. Accept it as a fact and pay them. You see, greed blinds people, so most rational people start making very irrational decisions,” says Dmitri Chavkerov of Forex Peace Army. 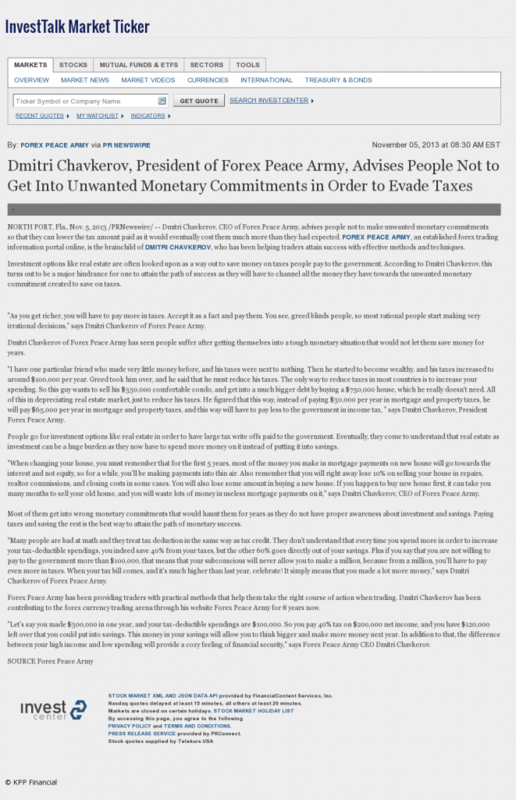 Dmitri Chavkerov of Forex Peace Army has seen people suffer after getting themselves into a tough monetary situation that would not let them save money for years. People go for investment options like real estate in order to have large tax write offs paid to the government. Eventually, they come to understand that real estate as investment can be a huge burden as they now have to spend more money on it instead of putting it into savings. “When changing your house, you must remember that for the first 5 years, most of the money you make in mortgage payments on new house will go towards the interest and not equity, so for a while, you’ll be making payments into thin air. Also remember that you will right away lose 10% on selling your house in repairs, realtor commissions, and closing costs in some cases. You will also lose some amount in buying a new house. If you happen to buy new house first, it can take you many months to sell your old house, and you will waste lots of money in useless mortgage payments on it,” says Dmitri Chavkerov, CEO of Forex Peace Army. Most of them get into wrong monetary commitments that would haunt them for years as they do not have proper awareness about investment and savings. Paying taxes and saving the rest is the best way to attain the path of monetary success. “Many people are bad at math and they treat tax deduction in the same way as tax credit. They don’t understand that every time you spend more in order to increase your tax-deductible spendings, you indeed save 40% from your taxes, but the other 60% goes directly out of your savings. Plus if you say that you are not willing to pay to the government more than $100,000, that means that your subconscious will never allow you to make a million, because from a million, you’ll have to pay even more in taxes. When your tax bill comes, and it’s much higher than last year, celebrate! It simply means that you made a lot more money,” says Dmitri Chavkerov of Forex Peace Army. Forex Peace Army has been providing traders with practical methods that help them take the right course of action when trading. Dmitri Chavkerov has been contributing to the forex currency trading arena through his website Forex Peace Army for 8 years now. “Let’s say you made $300,000 in one year, and your tax-deductible spendings are $100,000. So you pay 40% tax on $200,000 net income, and you have $120,000 left over that you could put into savings. This money in your savings will allow you to think bigger and make more money next year. In addition to that, the difference between your high income and low spending will provide a cozy feeling of financial security,” says Forex Peace Army CEO Dmitri Chavkerov.